Development of electrically powered DNA origami nanomachines requires effective means to actuate moving origami parts by externally applied electric fields. We demonstrate how origami nanolevers on an electrode can be manipulated (switched) at high frequency by alternating voltages. Orientation switching is long-time stable and can be induced by applying low voltages of 200 mV. The mechanical response time of a 100 nm long origami lever to an applied voltage step is less than 100 μs, allowing dynamic control of the induced motion. Moreover, through voltage assisted capture, origamis can be immobilized from folding solution without purification, even in the presence of excess staple strands. 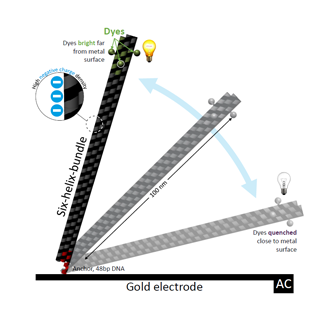 The results establish a way for interfacing and controlling DNA origamis with standard electronics, and enable their use as moving parts in electro-mechanical nanodevices.